I took the top photo on June 5th and the bottom photo exactly three weeks later. The high river levels are most obvious on the walkways, but can also be noticed on the bridge on the left. 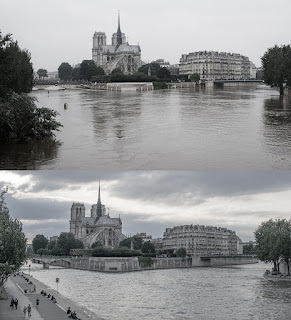 There was so little clearance below the bridges that there was no way the fleet of tour boats could operate.I had never seen the Seine running so high and am glad I was able to return for a comparison shot.